Investment firm Japan Hotel REIT has confirmed the acquisition of the Hilton Tokyo Odaiba for JPY62.4Bn which boosts its portfolio of 43 hotels throughout Japan. Hilton Tokyo Odaiba is a large-scale full-service hotel with a 4-star rating, located in Odaiba, one of the most popular tourist destinations in Tokyo. The hotel’s 453 guest rooms are spacious and are provided with breathtaking views of the city skyline over Tokyo Bay. The hotel is equipped with multiple Japanese, Western and Chinese restaurants, lounges, meeting rooms, wedding halls, a fitness centre, a swimming pool and a spa, as well as large and small banquet rooms, satisfying various demands from business and leisure customers as a full-service hotel providing sophisticated services by Hilton. At the 2020 Tokyo Olympics and Paralympics, various events will be held in Odaiba area while the International Broadcasting Center and Main Press Center will be situated at nearby Tokyo Big Sight. Hotel market in the Odaiba area is expected to grow further, as it will attract a lot of attention globally through the Tokyo Olympics and Paralympics. 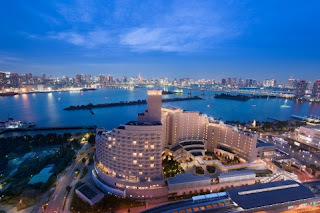 More details and reviews of the Hilton Tokyo Odaiba on Trip Advisor.